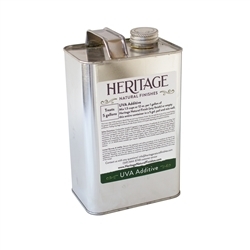 This is our broad spectrum clear UV protectant in a base of Pure Citrus Solvent which you can add to any of our Heritage Natural Finishes products. Enough to treat 5 gallons at our recommended rate. Shake or mix well into our oil finishes and apply as normal. Comes packaged in a half gallon size steel can with metal screw on cap.